Home » AU » featured » politics » Has the African Union really helped Africa? 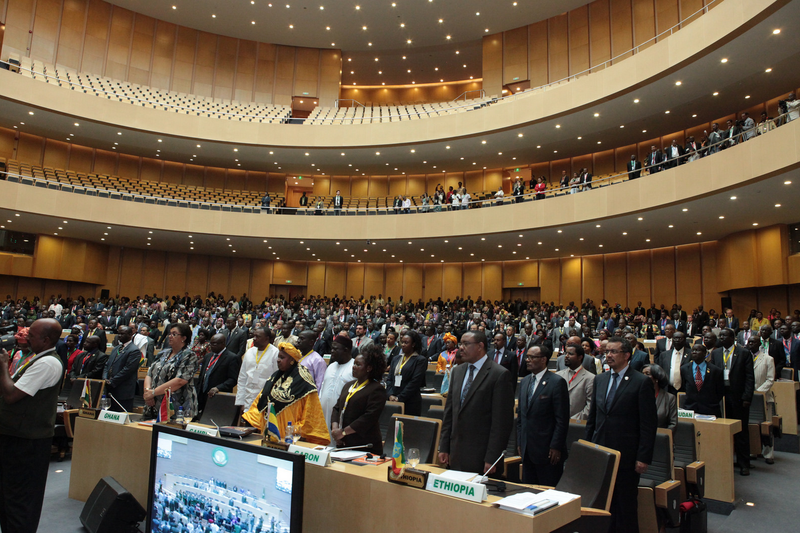 The African Union (AU), which is located in Addis Ababa, Ethiopia, was established in 2002 after its predecessor the Organization of African Unity (OAU) was dissolved. The AU consists of 54 members- all African Nations except Morocco. The OAU was formed in 1963 by 37 African Nations at Addis Ababa, Ethiopia. The OAU mission was to decolonize African nations, to address all massive poverty, to address the inequality of education and health-care, and to promote international cooperation and coordination of members’ economies, diplomacy, and etc. Sadly, the OAU shortly became an incompetent organization in solving conflicts among African Nations and not accomplishing its mission because the organizational leaders were invested with corruption and also its leaders were mainly discorded from the welfare of common Africans. The Rwandan genocide was one of the most memorable horrors that the OAU truly failed to respond swiftly to when it was clearly happening under the nose of the organization. From early April to July, members of Hutu ethnic majority indiscriminately murdered with machete as many as 800,000 (1) men, women, and children which mostly were minority ethnic of Tutsi. In early July, the minority Tutsi-under the umbrella of Rwandese Patriotic Front (RPF)-gained control of the country by military offensive. Unfortunately, the RPF victory created 2 million more refugees (mainly Hutus) from Rwanda, exacerbating what had already become a full blown humanitarian crisis. (1) In 1994, during the Rwandan genocide, Kofi Annan was directing the United Nation Peace-Keeping Operations and Susan Rice served as an Assistant Secretary of State for African Affairs during Bill Clinton’s second term as president. In 2001, Kofi Annan and United Nations were jointly awarded with the Noble Peace Prize “for their work for a better organized and more peaceful world.”(3) And during the Obama administration Susan Rice was promoted to ambassador to United Nations. Unbelievable! According to The Heritage Foundation,” Since the establishment of the African Union (AU) in 2002, the United States has provided millions in taxpayer dollars to support the organization and its activities. Regrettably, the AU makes it impossible to determine the success of this effort. The AU does not publish an annual report on its activities, make its budget publicly available, or conduct audits or other independent evaluation of its work or activities. This lack of transparency and accountability in the AU compares dismally with the practices of other international organizations that receive American funding, which are themselves often criticized for inadequate standards. U.S. ambivalence toward the AU’s opacity is at odds with the well-established U.S. policy of maximizing transparency in international organizations receiving U.S. funding. Congress should make U.S. contributions to the African Union contingent on the AU’s immediate adoption of practices to improve transparency and accountability.” (4). The vision of the African Union is supposedly “An integrated Prosperous and Peaceful Africa, driven by its own citizens and representing a dynamic force in the global arena.”(2) Since the inception of the organization, has it accomplished and sustained and rendered any ‘vision of peace’ in the Horn of Africa? Instead of rendering any peace in the Africa, the organization has truly failed to tackle the ongoing conflicts and unprecedented humanitarian crisis in Somalia and Ethiopia. The Horn of Africa environs have been an incubator for crisis and inflecting substantial figures of humans’ suffering for several decades with no vigorous remedies for the tumultuous regions on the horizon. 1. SOMALIA: In Oct. of 1969, the Somalian army seized the power after the President Abdi Rashid Ali Shermarke was assassinated. Subsequently, Maj. General Mohammed Siad Barre became as the President of Somalia. In 1997, the president engaged in the war to liberate the Ogadian regions from Ethiopia. The president fled the country in late of Jan. of 1991 after suffering heavy causalities in his army. Since the aftermath of 1991, Somalia has fallen into lawless lands in which variety of clan of warlords have ruled. According to the Center for Strategic and International Studies (CSIS), “More than 4 million Somalis, almost half the country’s population, require humanitarian assistance, including food, water, vaccinations, and health care, and 3 million of those are in conflict zones and difficult-to-reach areas. With an estimated 1.46 million displaced in Somalia, Mogadishu alone has become the site of over 300 internally displaced person (IDP) camps”. (5) Certainly, the vast majority of Somalis have been victimized by the chronic lawlessness in which no cohesive central government for engaging in constructive role to sustain the safeguard of the welfare of Somalis. Unfortunately, the people of Somalian have an aspirational endeavor to craft their own destiny in which to have a land of peace and prosperity. The African Union and International Communities (IC) have neither engaged in active role nor constructive role in solving the crisis in Somalia. Instead the AU and IC have deliberately closed their eyes and ears on the humanity of Somalis when the hoodlum of Woyena’s (TPLF) regime of Ethiopia has continuously been an instrumental institution of causing permanent havoc and inflecting unprecedented horror on the lives of women, children, and elderly in Somalia. Does the AU, as an African’s Institution, has an obligation to safeguard the Somalian humanity and to render the ‘Laws & Orders’ in the land of Somalia? If the AU could not safeguard its Somalian citizens of Africa from the inhumane TPLF regime than who? 2. OGADEN: Roughly the century of 19th, the Ethiopian Emperor Menelik II had annexed the region of Ogaden. In 1977, the President of Somalia Siad Barre waged a war with Ethiopia to free Ogaden. According to Africa Faith and Justice Network (AFJN), “A low intensity conflict is simmering in the Horn of Africa. Hundreds of thousands are displaced following the burning of their homes and the destruction of villages. Livestock and other possessions are being confiscated. Brutal sexual and gender-based abuses are a prevalent tool of warfare. Even worse, cold-blooded murder is widespread with horrific public executions. No, this is not Darfur. These systematic atrocities are taking place in the Ogaden, which is located in the Somali region of eastern Ethiopia.” (6) Where was the AU when the Ogaden citizens were being subjected to gross violation of human rights? 3. ERITREA: In April of 1993, overwhelmingly the Eritreans have voted for referendum in which was supported by the Ethiopian Government. Unfortunately, the hoodlum of Woyena’s regime of Ethiopia suddenly changed of its heart when Eritrea was becoming a nation of peaceful and prosperity; the regime shortly decided to invade Eritrea under bogus allegation of boarder dispute to validate their illegitimate invasion. From 1998 to 2000, the hoodlum Woyena’s regime engaged in the consecutive wars with Eritrea that heavy casualties of young men Ethiopians were sent as human-wave to be slaughter in foreigner lands of Eritrea. Shortly, the hoodlum of TPLF regime came into realization that capturing Eritrea was futile efforts to continue by any conventional war doctrine. In December of 2000, the hoodlum of TPLF regime of Ethiopia signed a peace agreement with Eritrea at Algiers, Algeria (Algiers Agreement). Both Eritrea and Ethiopia government had agreed for independent investigation of boarders conflicts. The independent investigation was called Ethiopian-Eritrean Boundary Commission (EEBC) which was spearhead by the Secretary General of Organization African Unity (OAU) under the umbrella of Secretary General of United Nations. In 2003, the EEBC issue final border ruling, but the hoodlum of Woyen’s regime rejected the EEBC decision and demanded for the International Court to alter its decision. Until now, hoodlum Woyen’s regime of Ethiopia has occupied Eritrean sovereignty contrary to International Court decision. The hoodlum of Woyena’s regime has continuously waged sporadic wars against peaceful Eritrean government and its citizens who are residing on the verge of borders between Eritrea and Ethiopia. Does the AU has a mandate on African nation respecting the integrity of another nations’ sovereignty? So, why are the hoodlum of Woyena’s regime should be exempt from the ‘Laws & Orders’ in which are recognized and enforced by International Courts and Developed Countries? 4. ETHIOPIA: The Ethiopian TPLF police massacred young, women, and elderly Ethiopians in a daylight during the 2005 election. The peaceful Ethiopians were being slaughter down by the indiscriminately bullets spray because they were exercising their self-determination rights on the foul election result by the hoodlum of Woyena’s regime. The massacre of innocent Ethiopians had taken in the place which was close proximity to the AU headquarter building. The AU could have immediately halt the TPLF police from massacring the peaceful demonstrators but instead it choice to turn its back from the Ethiopian people. Indeed, despicable act! Although bloodthirsty Menigstu Hail Mariam, who was the Communistic President of Ethiopia from 1974 to 1987, was considered to be butcher-leader to his people and to Eritreans by any standard, but at least he respected the magnificent and historical lands of Ethiopia. However, the hoodlum of Woyena’s regime has continuously been selling colossal of hectares lands of Ethiopia in which are the home for many indigenous tribes of Ethiopia. According to Genocide Watch, “In the remote western region of Gambella, tens of thousands of people have been forcibly relocated from their land. In 2010, the Ethiopian government initiated a villagisation program. The program intended to group scattered farming communities into small villages, with the aim of changing their lifestyles, and providing better access to food, education and health. However, the government’s plans are far from reaching these goals; the Ethiopian government has forcibly relocated approximately 70,000 people from their land with the intention to lease the land for foreign and domestic investment. There have been numerous reports of human rights violations. Many of the new villages where people are being relocated have inadequate food and lack healthcare and educational facilities. The Ethiopian government’s villagisation program has been extremely detrimental to the livelihoods of the people of Gambella. The government’s failure to provide food assistance has caused endemic hunger and cases of starvation. In addition, those who have resisted relocating are repeatedly assaulted and arbitrarily arrested. Through this program, the Ethiopian government is planning on relocating 1.5 million people by 2013 from the following regions: Gambella, Afar, Somali, and Benishangul Ghumuz.” (7) Again, silent of inhumane violations of many indigenous tribes who are evacuated from their ancestral lands by hoodlum of Woyena’s regime to satiate their hunger of wealth. Truly, and unbelievable that genocide of indigenous tribes merely is happening under the nose of AU headquarters. Where is AU….? Eldridge Cleaver once said “What we’re saying today is that you’re either part of the solution or you’re part of the problem” The AU has merely become a part of a seemingly everlasting problem for Africa, becoming equally incompetent as its predecessor in responding swiftly to crisis in the Horn of Africa and other regions. Therefore, the Ethiopian citizens must question the virtue evinced by the AU headquarters in Addis Ababa, Ethiopia. African citizens and International Communities must find a vigorous remedy for the pervasive coma of the status-quo African Union. We can truly no longer suffer fragmentary thugs with elegant-suits in the Horn of Africa. Guest Articles solely express the views of the Author, not necessarily those of the African Dynamo Editorial Staff.